Whether you want two chickens or two hundred, this manual will guide you along your journey to successfully raising chickens. Growing a backyard chicken flock is an investment, and one of the most important factors in cultivating a happy, healthy poultry society is taking the time to learn everything you can about your birds. 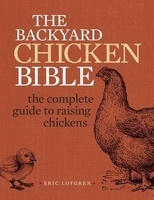 The Backyard Chicken Bible is filled with real-life solutions and expert advice on what to do in almost any scenario you may find yourself in while raising chickens. No matter if you're starting with eggs, chicks or adult birds, you'll find the guidance you need to succeed. Take the guesswork out of raising chickens, and start preparing yourself now to be the best chicken farmer in your neighborhood!